The Wandle Waters Fellowship is a voluntary group that promotes research, conservation and celebration of the Springs, Spouts, Fountains and Wells of the Wandle Valley. The River Wandle is a river just to the south of London. It is fed by spring water emerging from the North Downs chalk, along the east-west juncture of the chalk and London clays. 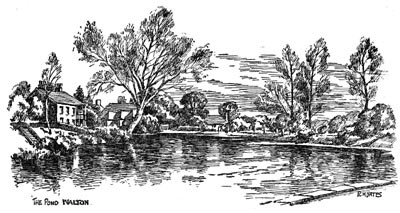 The river runs through southwest London and is about 9 miles (14 km) long passing through Croydon, Sutton, Merton, and Wandsworth where it joins the River Thames.The names of the river and of Wandsworth itself are thought to have derived from the Old English "Wendlesworth" meaning "Wendle's Settlement". The River Wandle in prehistory was much more visible than the river we see today. The catchment area extends high on to the North Downs and Caterham Valley, Chipstead Valley and the Merstham gap were once surface tributaries of the ancient Wandle. Today the river is fed from springs emerging from the chalk along the northern foot of the North Downs as the water table within the chalk hills is now well below the surface. The causes of this long term change in topography are geological evolution and much more recently the introduction of extensive water extraction by the Victorians. 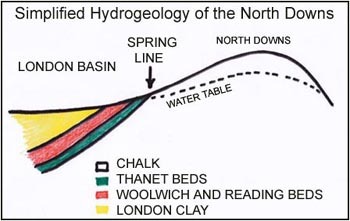 Nevertheless, springs do still erupt higher in the catchment area and the seasonal bourne waters through Kenley are an example. The catchment area of the Wandle is similar to that in prehistoric times, merely that the water flows down through the chalk rather than overflows onto the surface. With fluctuations in rainfall from one year to the next however the water table level varies. An example of this was in the first two months of 2014 when exceptional rainfall caused flooding throughout England. This resulted in flooding of areas around the bournes and throughout the valley of the Wandle. The following press article gives and indication of the extent of the problem in the lower lying areas. It also however resulted in long dry features such as the Westcroft Canal in Carshalton returning to their original appearance as the designers intended with water flowing profusely. 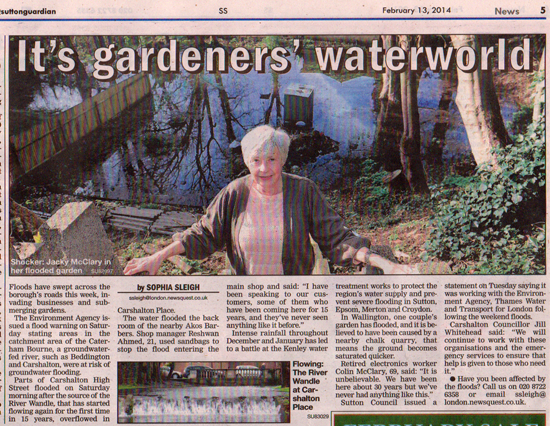 Press article from the Sutton Guardian February 13 2014. For a larger version click the picture. High on the North Downs is what is probably the most remote vestige of the prehistoric Wandle. The large Mere Pond at Walton on the Hill, which is believed to date back to Saxon times, lies at the very perimeter of the catchment area. It is reputedly fed by a spring (Clew 1968) and on inspection it is apparent that the modest valley has been dammed to enable spring water to accumulate as a pond. On the western side can be seen a rivulet running into the pond when the water table is high. This suggests near surface water forming a spring as it accumulates in the dip of the land. The dam is now the road alongside the pond. The spring/pond overflows into a slight valley to the east that drains into the Chipstead Valley. This in turn forms part of the ancient dendritic catchment for the Wandle via Purley and Croydon. The pond was once an important source of water for local residents and in 1868 it is recorded that it was decided to erect a pump on the pond together with a charcoal filled tank to provide pure drinking water. The pump remained in use until 1898 when mains water became available. Once known as the most polluted and industrialised river in England, in recent years much effort has gone into enhancing the Wandle. Previously culverted sections have been restored to their earlier course and appearance. At one time extensive ponds and watercourses existed in Croydon Old Town, especially around the Bishop's Palace. These were fed by local springs. Now the river is first visible in Wandle Park, Croydon from where it flows into Waddon Ponds beside Mill Lane. A second main source is found at Carshalton Ponds, which merges with the Croydon branch at Wilderness Island in the northern area of Carshalton. Above - The Lindley and Crosley 1793 map of the River Wandle from the springs around Croydon and Carshalton to the Thames at Wandsworth. Other sources include the Norbury Brook/River Graveney tributary. Springing at Addiscombe as the Norbury Brook, the river Graveney joins the Wandle at Merton Mills. Two seasonal streams, the Coulsdon Bourne and the Caterham Bourne, run in wet winters. They join together at Purley, run in a culvert north along the Brighton Road and join the River Wandle at the Swan and Sugarloaf pub in South Croydon. Now much of the heritage of the modern day River Wandle has been conserved and used to create an attractive recreational landscape. In addition there are numerous projects to further enhance the river environment. 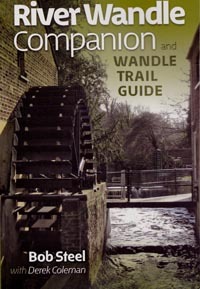 A Wandle trail exists along much of the course and is well worth exploring. To find out about the Wandle Industrial Museum click the logo left. Clew K. (1968) Walton - An Illustrated History. Jones A E (1980) The Story of Carshalton House. Steel B. (2012) River Wandle Companion. 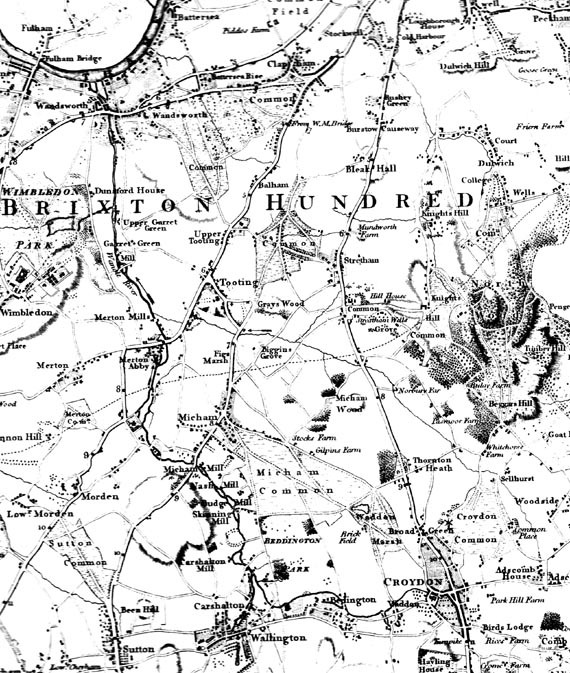 Whitaker W. (1912) The Water Supply of Surrey, HMSO. Tower House, Tadworth, KT20 5QY. UK. Copyright - the text and many of the pictures on this web site are copyright and should not be used elsewhere without permission. Click the titles to go to the details of the Springs, Spouts and Fountains associated with the River Wandle in that locality.